Four years ago I was in the middle of deciding my future while in the middle of completing grade 12. I had it mapped out that I would take a gap year and then complete my double business degree at the University of Queensland (UQ). I was convinced that I should have Griffith’s double degree as my second choice and QUT’s single program further down. My OP came out later that year and it wasn’t high enough to gain me entry into UQ’s Business Double Degree – disappointment set in. I settled for my double degree at Griffith and since studying at Griffith I have never had any regrets. These days I live and breathe Griffith – quite literally! Take today as an example. I woke up to a bright and chilly morning here at Griffith’s self-catered college, KGBC. I then headed over to campus where I spent 6 hours volunteering at the open day for the Business school as a part of the Leadership Program. I am now currently working on my report for my recent international trip to Borneo with the Leadership Program. Tonight, In my role as RC Vice-President at KGBC, I shall be chairing our weekly Residential Committee (RC) meeting. To top it off I will do some final prep for my Revenue Law class tomorrow morning. Talk about breathing Griffith! 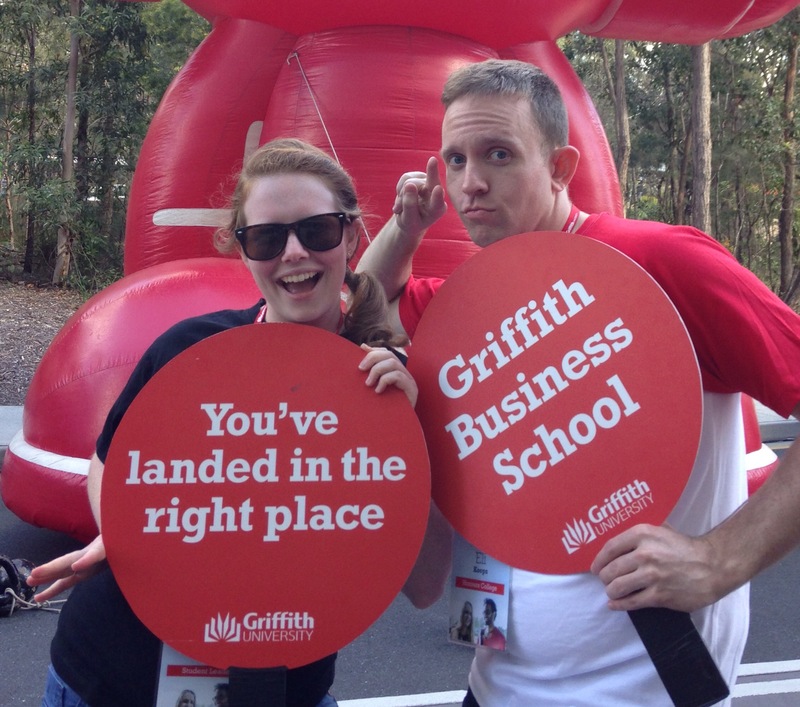 Once you tap into the opportunities at Griffith you can’t go back. So, here’s my student interpretation as to why Griffith is actually an awesome place to study! I was recently studying on campus and I was interrupted by a bush turkey that was casually walking around trying to find some food. You would think after studying for three years I would be used to this but I still love watching them walking around! It sounds a bit strange to plop a University in the middle of a national park but they did it anyway. The older sandstone universities like UQ are gorgeous and at times I am envious at their exterior and their established traditions. Although, just because we don’t fit that mould, doesn’t mean we aren’t rocking the University stage. Since leaving school I have realised that the people and things that are different are what make life more interesting! It’s awesome to attend a University that has been going for 40 years. They are constantly testing the waters and trying new techniques out – nothing is off limits. Last year I attended three 2-day introductory days at three of the Big 4 Accounting firms. I noticed however that at each company the 20 other people were all from UQ or QUT. Why? Why? Why! I asked one of the recruiters this question and she simply stated ‘We don’t attend career days at Griffith’. I personally had to search and find that opportunity rather than an external person coming in and handing me an ‘apply here’ form, but I wouldn’t have it any other way. In saying this, it does not mean that we don’t have opportunities, not at all! Most of my friends have participated in an overseas semester, course or project. I know of people who have a graduate position in major international companies. Once you search and tap into the wealth of opportunities found you’ll be astonished with everything that is available! Every year Griffith is adding new opportunities and don’t forget we are only 40 years old so we don’t have the ‘sandstone’ university reputation… yet! To follow onto my previous point, Griffith encourages students to create their own opportunities. If you find there isn’t a club or society for your chosen field or passion, then create it! When you take it upon yourself to recognise an area within the University that is lacking you and seek to fill that gap, you are creating a new set of skills which goes beyond the textbook learning. Over the years I have been involved with varying roles from attending extra class sessions and also being a Study Buddy Mentor for first year subjects. Griffith has extensively identified the most challenging periods of a degree and have provided extra support. University is a tough place when you start juggling life’s curve balls and they want to make it as easier as they can. I have sat in numerous business school orientations where they spend an hour introducing the support systems and people in place for students. The amazing thing is, they actually back it up and those same support systems for your first year are there for you in your final year. This is one point that I absolutely adore about Griffith! They understand that we enter our studies with a story and a history not just another student number. Whether we are fresh out of high-school, a single mother/father, a mature aged student who wants to change careers, or anything in between, they actually care. They also want you to know that they are people too! They break down the barriers and their doors are always open. In my first year I suddenly had to withdraw from two of my courses and defer my two remaining subject’s assessment in week 9 for personal reasons. Life doesn’t stop when you sign up for a degree! All the way from admin to my lecturers I was offered a full level of support and coming back to the same courses the following semester was a lot easier. By all means, Griffith is more than those points previously that I referred to. In my opinion, University isn’t just a place where you complete assessment and magically receive a certificate. It’s a place where you challenge yourself, you create lasting relationships and above all else you come out a different, stronger person. If you’re in a similar position that I was in 4 years ago, don’t fret. Take a chance and do something different, even if it isn’t what your friends are doing. It’s all about finding the best fit for you.